Last week I attended the 12th annual Earth & Space 2010 conference. The American Society of Civil Engineers (ASCE) sponsors the biennial meeting to bring together experts from a variety of disciplines to discuss exploration, engineering, construction, and operations in challenging environments both on Earth and throughout the solar system. Civil engineering holds the key to solving many of the challenges needed to create sustainable outposts in hostile environments including providing power, mitigating low gravity and dust, protecting against radiation, using local resources, exploring the subsurface, and much more. The meeting was held at the Sheraton Waikiki hotel, which offered breathtaking views of the ocean, as shown from the window in the meeting facility here. Tracks in the conference dealt with lunar and martian regolith materials, sustainable development, intelligent sensors, aerospace vehicle control, offshore wind turbines, fluid dynamics and heat transfer, structural health monitoring, disaster mitigation (engineering seismology), nanotechnology, and advanced construction materials. I spent the majority of my time at the meeting in Track B, which focused on exploration and utilization of extraterrestrial bodies. I took copious notes from the technical sessions, but I'll just summarize a few of the presentations here. Haym Benaroya kicked off the session with a really good interdisciplinary, holistic treatment of lunar settlements. He considered topics ranging from the the lunar environment (radiation, low gravity, dust/regolith, moonquakes, etc.) to engineering (habitat structures, power systems, resource extraction, power, etc.) to human factors (physiology, psychology, politics/law, business, tourism, etc.). He stressed that the first generation of lunar missions will bring everything with them; second generation missions will utilize local assembly of structures; and third generation systems will make their resources from local materials. The right to ownership for resources like Helium-3, platinum, and solar power needs to be worked out, and we need to strike a balance between economic development and environmental preservation. I found his discussion on how tourism would deal with issues of insurance and health care very interesting too. Benaroya is the author of two new books on this subject: Lunar Settlements and Turning Dust to Gold: Building a Future on the Moon and Mars. He projects milestones of returning to the Moon in 2024, landing on Mars in 2034, establishing a permanent Mars colony by 2041, first human born on the Moon in 2099, and terraforming of Mars by 2169. Peter Curreri gave a fascinating talk on the rationale why humans must establish permanent off-world colonies in order to avoid extinction. He based the argument not on the possibility of a catastrophic impact event but instead on the human propensity for self-extinction. Basically, the exponential growth of technology puts potentially dangerous technology like nuclear weapons in the hands of more and more people as time moves forward. It's only a matter of time before someone has both the ability and the motivation to push the button and cause widespread extinction on Earth. Curreri estimated that in 1950, 10 people had access to technology that could end life on Earth, but in 2010 the number is closer to 1000. Thankfully, most of these people are not likely to use the technology, but he argued that, based on the psychological literature, the murder-suicide rate is 0.2-0.3% in any population. Multiplying this rate by the number of people with the ability to make humanity extinct, he forecasted that the probability of humans blowing themselves up will reach 1 in 2090! We'd better act fast to ensure our survival. If we had just one permanent human colony off Earth, that rate would be cut to only 0.1 in 2090. To completely ensure the survival of the human species, Curreri recommends building at least 70 "mini" O'Neill-Glaser style habitats in space that support populations of 300 people, utilize space solar power, and pay for themselves in 25 years. Brand Griffin of Gray Research presented a very promising lunar exploration strategy called "Lunar Daylight Exploration." He noted that with only 1 rover, 2 astronauts, and 3 days, the Apollo 17 mission covered 36 km, setup 10 scientific experiments, and returned 110 kg of samples. That's really good. He posed the question what could the Apollo crew had done with more time and today's modern robotics? 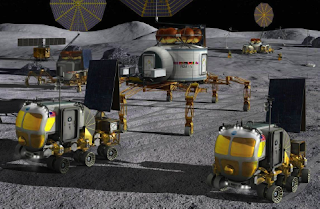 Griffin envisions a low-cost approach of lunar exploration inspired by Apollo whereby robotic rovers and landers first go scout out the most important scientific sites. Later, 2-person human crews land at the locations deemed to have the highest scientific value and spend an entire lunar day (14 Earth days) exploring the areas. The rovers, which had previously been teleoperated, would also be able to be manually driven by the astronauts up to 768 km when they arrive. He envisions an overall strategy using 4 robotic landers and 10 crewed missions in this scenario. 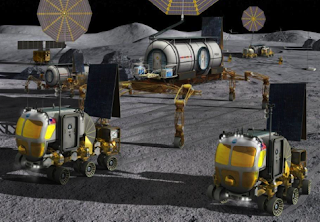 This "campout" model has greatly reduced consumables, radiation exposure, physiological degradation, and risk compared with longer term lunar mission concepts. This would allow us to visit more places, do a greater variety of science, and gain experience with planetary surface operations. I think these sorts of missions would be excellent training opportunities for Mars astronauts as well. The first Track B session of the meeting dealt with ISRU, and it was so popular that the meeting organizers had to find a larger room. NASA's In Situ Resource Utilization (ISRU) Program Manager Bill Larson gave the first talk on "Overcoming the Hurdles of Incorporating In Situ Resource Utilization (ISRU) into Human Lunar Exploration." He defined ISRU as any hardware or operation that harnesses and utilizes 'in situ' resources to create products and services for robotic and human exploration. These resources could be both natural and manmade (e.g., reusing discarded materials). IRSU encompasses a wide range of activities such as resource mapping/characterization, mission consumable production, surface construction, energy generation/storage/transfer, and equipment manufacturing/repair. ISRU is a critical capability required for sustainable long term human space exploration, but it is largely unproven. This is why mission planners are usually reluctant to put ISRU in the critical path of a mission. Therefore, we need to develop ISRU technologies now so they are mature in time for lunar and martian exploration. The caveat is that this could lead to higher up front costs and potentially delay human exploration. However, in the long term, it will minimize uncertainties, shortfalls, and costs while increasing sustainability, crew safety, and capabilities. Larson said ISRU research and funding will increase if Congress approves the President's proposed NASA budget. 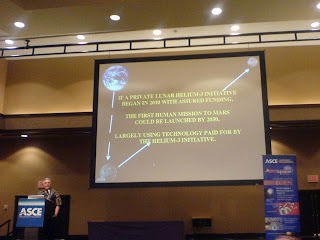 Larson, Dale Boucher, and Robert Fox also spoke at length about the PISCES lunar analog field work done on the Big Island of Hawaii in 2008 and 2010. They highlighted the recent January-February 2010 field test of a closed ISRU cycle whereby a rover scooped up tephra and dumped it in a carothermal reactor where it was heated to 1650-1800 °C using solar collectors in a methane environment. This produced carbon monoxide and hydrogen, which went into a methanation reactor to produce methane and water. Then, they separated the water into hydrogen and oxygen via electrolysis. The oxygen yield was 9-10% by mass, which is pretty good. You can see photos of the field work above or here, here, and here. You can also read about the project on SPACE.com and the Honolulu Advertiser. Follow the group @NASAdust2thrust on twitter too. The Planetary Analogs session may have been my favorite. It focused on work being done on Earth to test procedures, methodologies, equipment, and technologies for later application to lunar and martian exploration. The challenges faced by people on long duration deployments to remote outposts (established or temporary) are similar to those future explorers will face on Mras. Two talks focused on how Antarctica South Pole Traverses are like operations on the Moon or Mars. Robert Mueller (NASA), Stephen Hoffman (SAIC), and Paul Thur (Raytheon) discussed how the long 1600 km (1000 mi) traverse from McMurdo Station to the South Pole is analogous to lunar or martian traverses. Both must tackle issues of resupply, caches, cold conditions, etc. The NASA concept for a lunar traverse is 4 crewmembers on a 6-month mission to cover thousands of kilometers. This will allow for regional to near global access and the ability to do much more science than staying put at one base. They defined the "Support Equipment Ratio" (SER) as the ratio of support equipment needed vs. the amount of deliverable cargo. In the 2009-10 Antarctic South Pole traverses, the SER was 1.38:1, and this will drop to 1.15:1 once they completely switch from steel skis to plastic sleds. NASA's analysis suggests a lunar traverse would have a SER of 0.97:1, which is pretty close to the Antarctic experience. For either Antarctica or the Moon, the biggest technology development issues pertain to gray water recovery and environmentally friendly waste disposal. Crews for long duration lunar or martian traverses will likely train in Antarctica. 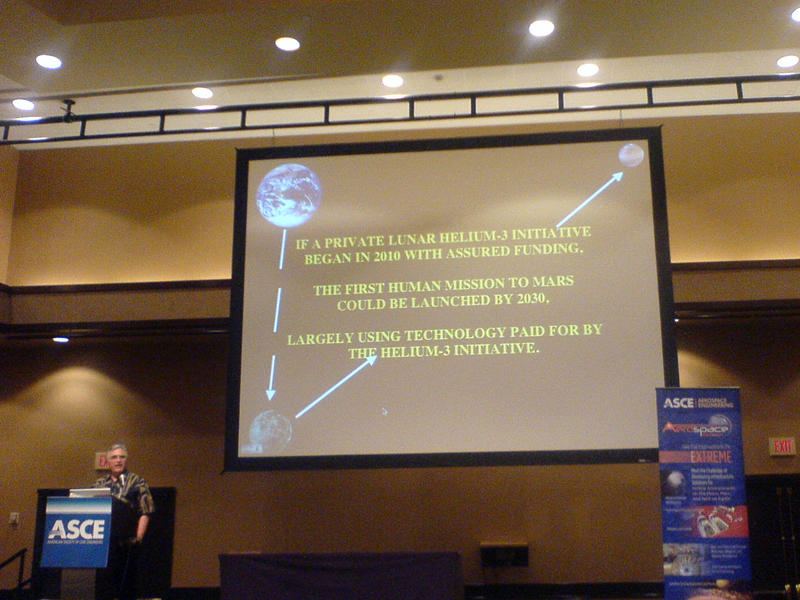 Hoffman later gave another presentation emphasizing that we now have more than 50 years of Arctic and Antarctic experience that we can leverage for lunar or martian exploration. Some of the examples included the Norwegian-British-Swedish Expedition of 1949-52 (15 crew, 1240 km longest traverse), International Geophysical Year traverses of 1956-58 (8-9 crew, 2300 km longest traverse), Queen Maud Land traverses of 1964-68 (10-11 crew, 1556 km longest traverse), and Northwest Passage Drive traverse of 2004 (4 crew, 250 km traverse). His main focus was how these types of expeditions are analogous to mobile exploration scenarios in the Mars Design Reference Architecture 5.0. 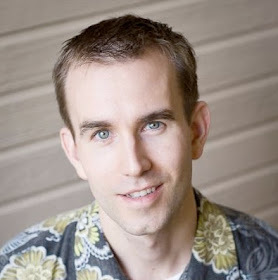 Hoffman summarized a workshop held last year on "Arctic and Antarctic Analogs for Planetary Surface Traverses". I encourage readers to click on the link to read the PDF report of from that workshop. Brian Glass from NASA Ames rounded out the session by summarizing some of the major terrestrial Mars analog sites and their relative strengths and weaknesses for drilling automation testing. Drilling is an important activity for most proposed exploration strategies since it allows the study of subsurface ice/volatiles, the regolith/upper crust, biomarkers/life, heat flow, resource characterization, etc. While teleoperated drilling might be okay on the Moon, the time delay to Mars means that we'll have to automate the work. 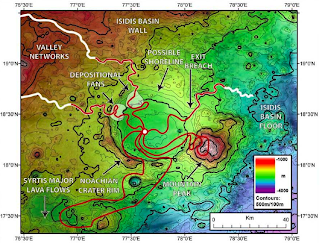 Some of the sites he compared were Barringer Crater and Black Point in Arizona, Moses Lake in Washington, Rio Tinto in Spain, the Idaho National Laboratory, the Atacama Desert in Chile, Lonar Crater in India, Mauna Kea in Hawaii, the Dry Valleys of Antarctica, Svalbard in Norway, and Devon/Ellesmere/Axel Heilberg Islands in Canada. For a more complete treatment of Mars analog sites on Earth, check out the 2004 NRC report. I got to know Brian on Devon Island last summer during the FMARS mission. He helped me out by turning off radio transmissions to his automated drill experiment during my electromagnetic experiment. You can watch him in the video below. Planetary drilling, Sample return, and dust mitigation were big themes too with several sessions devoted to them. This post is getting long, so I'll skip the long-winded summaries, but you can see my notes for the details. If you're a regular reader of this blog, you probably remember that back in January, I met Apollo 17 astronaut Jack Schmitt at the LunarGeo 2010 workshop. One of the reasons I was so excited about attending the Earth & Space 2010 conference was because Schmitt would be there too. The first astronaut scientist to walk on another world received the Columbia Medal for his long-standing contributions to space exploration and gave the keynote address at the ASCE Awards Reception. His talk focused on lunar science and the energy resources that are available there (particularly Helium-3). Jeff Taylor gave the reception's opening talk on why we should explore the Moon. Prior to the keynote addresses, A Babe in the Universe and I had an interesting discussion about human missions to Mars. She thinks we can get by with as little as two or perhaps even one person on the crew. I think you need at least four people and preferably more. We both agreed that more long term isolation studies like Mars 500 are needed to work out the psycho-social and crew selection issues. All-in-all, the Earth & Space 2010 meeting cemented in me a better understanding of the engineering issues related to living off-world and that the Moon has a lot to offer as a testbed. Very interesting, especially those statistics of when humans might destroy ourselves. Even if you are skeptical and assume those stats are off by 100%, doubling the timeframe isn't THAT far off! Looks like a very interesting conference. I think that the drill is an example of how easy it is to trivialize space exploration and criticize cost - it takes a lot of innovation to have something work reliably as space hardware, since repair cost is so prohibitive (what happens next time Hubble has a problem?). As for the Mars analogs, There has to be redundancy in everything for such a long mission where a restart is a very difficult and costly thing to do, and that includes people. In a mission with a length of a year and a half and so far, human conditions that never happened in space may and will happen, including (at some point) the first death in space which is not a result of hardware catastrophy. Having one person go or even two is out of the question. Even three or four is questionable unless they get trained like a RAID-5 hard drive array - N-1 drives (or people) hold all the necessary information (and skills), so a failure of one drive (or death of one person) doesn't jeopardize any data (or the mission). Sounds harsh, but unlike LEO or even the moon, where one is at most a few days from rescue, a year and a half is enough time to die from an early undetected Cancer without treatment, for example. Thanks Brian, a thoroughly absorbing and terrific post, I really should be getting to some of these conferences soon, when I complete this plasma training schedule. It would be helpful if hospitals had more brain and spine scanning equipment, the waiting list is crazy!!! Obviously the correctly so emphasis on IRSU will become a main player thesis in universitie's, it will probably serve as a p.h.d project now, but, I really hope it get's it's way onto the degree syllabus, but, I think that most of us at the front of this science discipline comprehend the gravity of the situation regarding performance. I think it's an excellent choice that the president has decided to let us do the ground work now, I've been learning and training for this my entire life as have many others, but, really, it's cutting the teeth that this is about now and personally I think it's really really exciting to be keeping tally with all the possible vessel scenario's available for science and exploration.